Please make sure you go to our Facebook page and click on "like". We are constantly adding updates such as new videos, articles and contests on it. This report is usually updated weekly, so any last minute updates on river conditions, regulation changes etc usually go on our Facebook page right away. OVERVIEW – Due to the recent cold and snow, there was little fishing, if any, done during the week. Anglers did start going out again on the weekend and fishing for winter (feeder) chinooks was GOOD. The chinooks have been close to the bottom and glow spoons and anchovies in glow teasers have been the most effective lures. BECHER BAY – Salmon fishing was FAIR near Becher Bay. This past weekend the salmon were in the Bay from the marina to Lamb Island. The size has been relatively small with the fish under 8 lbs in size.The best depths to fish have been between 100 to 140 feet on the downrigger. The fish have not been too picky about what they will strike and anglers are mostly using spoons and plastics for lures. Good spoons have been Skinny G's, Coho Killers and Coyotes with glow on them. Needlefish hootchies in White, Glow/Green and Purple Haze are the top choices in plastic baits. Large anchovies wee working too and effective choices for teaser head are Chartreuse, Tiger Prawn and Bloody Nose. The GIBBS Highliner Guide Series Outfitters, the Betsey, and Gold Fever Hot Spot flashers have been working well. PEDDER BAY – Pedder Bay Marina reports FAIR salmon fishing at Pedder Bay. Although not many boats were out, anglers were catching springs up to 8 lbs in size near the can buoy at the mouth of the bay. The fish have been close to the bottom around the 100 foot depth. Spoons have been the most popular lures, with the 4" Silver Horde UV herring Aid the "hot" lure. Coyote spoons have also worked well as the fish are targeting herring and not needlefish. Hootchies and squirts are still working with green and glow, Purple Haze or UV white good color choices. Flashers that are popular include the Guide Series Madi, Outfitters and Lemon Lime. Good choices for teaser head colors are Bloody Nose, Chartreuse and Purple Haze. 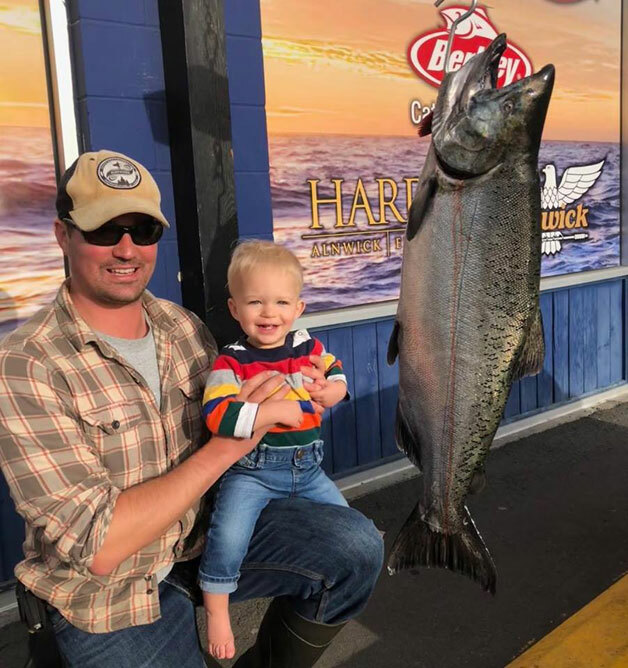 VICTORIA – Overall, salmon fishing has been GOOD. There were lots of salmon from 4-8 lbs throughout the area, with some larger fish as well. This past weekend Ed Beatty kept an 11½ and 8½ lb springs and released a couple in the 6-8 lb size. Ed was fishing on the Esquimalt side of the waterfront. The salmon have been down along the bottom so most anglers are fishing deep, from 100 to 150 feet. Spoons are working well to with Skinny G's and Coho Killers in Irish Cream, Brass/Silver and the AP Tackleworks 4" MVP herring spoon good choices. Tomic 4" classic plugs have also been working well recently. OAK BAY – No recent reports have been coming from Oak Bay. Previously, fishing for springs was FAIR on the flats but most of the fish were small. There had been larger fish out at Border Bank. Anglers had also been reporting springs up to 10 lbs on the Flats in 100-140 depths. Trollers had been catching the salmon trolling small spoons; Coho killers, Wee G's and AP Sandlance spoons. Most of the anglers have been bottom bouncing squirts and spoons or jigging close to the bottom. Best bets for Oak Bay trolling lures are Wee Gs, Skinny Gs, Coho Killers and AP Tackleworks Sandlance spoons. Squirts will also work with Jelly fish and Electric Chairs good bets. Jiggers are using Deep Stingers and Point Wilson Darts. SIDNEY – No recent reports have been coming from Sidney. Previously salmon fishing was FAIR but most of the springs were under the size required for retention. There are herring entering the inlet and drawing the salmon with them. Satellite Channel has been producing well for both salmon and prawns. Moresby Island also had some fish and the Sidney channel, from the Red Can to the James Island Powder Wharf areas has held fish. Suggested spoons are Coho Killers, Gibbs Needle G and Wee G spoons and AP Sandlance spoons. Suggested colours are Green/glow and blue/glow. Anchovies and Tiny Strip were also good in Glow or UV Purple teaser heads. Notable Catches – This past weekend Ed Beatty kept an 11½ and 8½ lb springs and released a couple in th e6-8 lb size. Ed was fishing on the Esquimalt side of the waterfront. COWICHAN RIVER – The water level on the Cowichan is still receding and is in good shape for those drifting the river or fishing from shore. It's close to 0.94 near the lake and 0.9 meters near Duncan as I write this. The Riverbottom area has been the heaviest fished and steelhead are in all the usual places. Anglers are catching steelies on both gear and flies. Trout fishing has been good as well. TROUT – Trout fishing has been GOOD for trout at the local lakes. Shore anglers are catching trout on Powerbait, Gulp Eggs, and worms while fishing close to the bottom. Pink, Chartreuse and Fluorescent Yellow have been good choices recently for Powerbait. Fly anglers are mostly fishing Wooly Buggers, Leeches and Spratley patterns on full sink fly lines. Trollers are catching trout with worms fished behind Gibbs Gang Trolls and on Gibbs Wedding Bands. 2" Tomic Plugs have also been working well for trout. To find out about fish stockings all over the Island and the province, as well as the different strains being released, visit this page. BASS – Bass fishing is SLOW on Island lakes with the cold water temperatures. Soft plastics are a great choice now. The most productive colors in 4" Yum baits are Smoke or Pumpkinseed. Drop shot fishing can be very effective this time of year if you find fish in deeper water. Langford Lake, Shawnigan Lake, Prospect Lake and Elk and Beaver Lakes are the best local bass lakes. St. Mary's Lake on Salt Spring Island is also a great lake for bass fishing. Buy Two! Murphy's Law dictates that if you have a hot lure, you're sure to lose it. If you don't have a back up you're out of luck. So next time you pick up the newest hot lure or fly, consider buying two. And don't miss out on all the bargains at this coming weekend's Fishing and Boat Show at Eagle Ridge Arena in Langford!